In the largest refugee crisis since World War ll, 65 million people around the world are displaced, one percent of the population. On average, it takes refugees 17-20 years before resettling and finding a permanent home again. During this time, they face insurmountable challenges and an uncertain future. One of the toughest challenges refugees face when arriving to refugee camps, says Professor Azra Aksamija, Director of The MIT Future Heritage Lab and Associate Professor of the MIT Program in Art, Culture and Technology, is becoming passive receivers of humanitarian aid and losing control of their own lives and their own decisions. Often times, refugees are given no choice over the food they eat, the education they receive, and are not allowed to modify the shelters they live in. While the solutions that international aid organizations develop in response are necessary to manage the challenging logistics of the refugee crisis, the design of the camps often neglects the emotional and cultural needs of refugees and can be disempowering. The Future Heritage Lab encourages refugees to discover creative responses to the turmoil and distress they are experiencing. In order to rebuild a society and preserve its history during and after a time of conflict, culture must be understood as a basic human need. To counter the erasure of cultural memory that is inevitable when children grow up in refugee camps, when that is the only world they know, they must be exposed to both their own heritage and global culture. Prof. Aksamija and her team have been working with refugees at the Al Azraq camp in Jordan since 2016. Collaborating with the residents of the camp, as well as local Jordanian academic partners, the Future Heritage Lab supports their artistic and educational initiatives and helps preserve cultural memories by engaging in creative art and design projects with refugees. 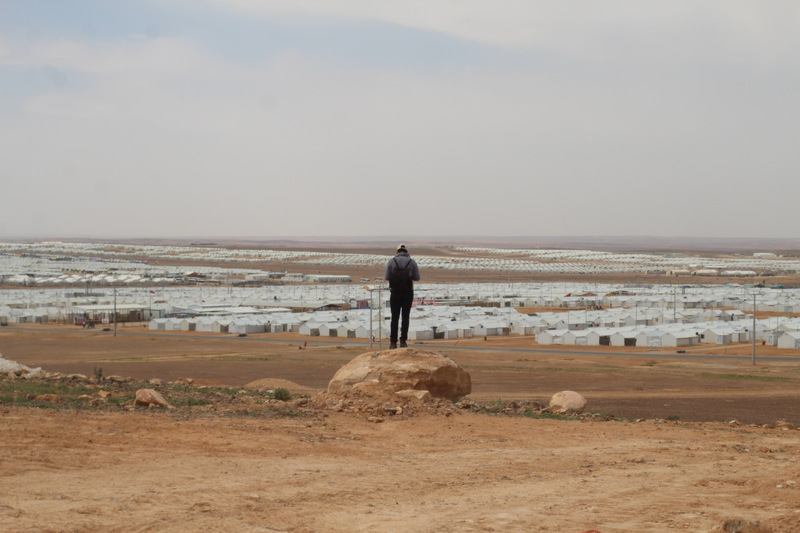 Loss of cultural memory, boredom and idleness, and a decreasing interest in education, Prof. Aksamija explained, are faced by children, teenagers, and adults alike in the Al Azraq camp. However, they are extremely innovative and inventive, creating things like DIY air conditioners, windmill-powered lamps, and artwork using ordinary objects found around the camp. These designs show the unique resourcefulness found in times of duress and survival. The Future Heritage Lab aims to support the creation of art, design, and educational projects towards civic innovation on a large scale. The Lightweaver is a kinetic lighting device and an interdisciplinary educational model that was designed in collaboration with the artists and engineers at the Al Azraq camp and prototyped through transcultural exchange across MIT, Amman, and Al Azraq camp. The Lightweaver project and workshop introduces students to electronics, mechanical engineering, design, cultural history, and arts and crafts. The Lightweaver provides an aesthetic and non-intrusive transformation of the shelter design, increases interest in learning, and encourages personal expression while preserving cultural knowledge. There is a deep question of ethics when working with refugees, as Prof. Aksamija notes. How can we address this crisis in light of the pressing political and ethical concerns? Is the project being implemented really benefiting refugees? Where can we be useful to refugees as a university, as humanitarians, designers, and researchers? How to avoid a colonial approach: are the refugees participating in, collaborating or driving this project? How can we facilitate multidirectional knowledge exchange? When doing a project with refugees, the focus should be the purpose, the long-term mission and impact. The lines between empathy towards refugee communities and exploitation from the publicity and benefits of working with them is often blurred. Collaborating with the refugees and a wide range of international and regional experts, the Future Heritage Lab is developing the Code of Ethics as an online platform to offer an international channel for dissemination of questions and dilemmas that researchers and design practitioners may face when working with populations in crises. Refugees in the Al Azraq camp are not permitted to leave the camp without a special permits, meaning that most of their days are spent confined to their shelters since there is no social or meeting space. The Future Heritage Lab is in the process of building a facility for its satellite Lab at Al Azraq where the creative and educational process of preserving cultural heritage will be expanded. Not only will the space have classrooms for men and women, but a makerspace, a social space with a showroom where the artists and inventors from the camp can display their work, and a kitchen where residents can make their own meals and preserve the richness of the Syrian cuisine. The Lab will also serve as a place to disseminate knowledge amongst one another and a place where social cohesion between refugees and local Jordanians can exist. It will be a place where the younger generation will become equipped with the skills and historical context needed to restore their societies. Every wall and component of the Lab will be co-created with refugees as an educational and creative project to learn from. In the environment of the refugee camp, with no privacy and no certainty of what is to come, everything is intensified, Prof. Aksamija says from experience, both the good and bad qualities of the people and the camp. Providing refugees with a facility to make social and transcultural connections, discover and solve their own problems in an innovative way, and share these designs with their peers will, The Future Heritage Lab hopes, have a long-lasting and positive impact on their psyche and their lives. If this lab is successful, it will be implemented at scale in other locations and camps. The impact of this project is difficult to measure, at least quantifiably, Prof. Aksamija told us. We can analyze best and worst practices and do better next time, of course, and keep track of the number of refugees that attend their workshops, yes. However, the real measure of impact is how empowered the residents of the Al Azraq camp felt by addressing their emotional, cultural, and historical needs and collaborating with each other and The Future Heritage Lab to create their own solutions and projects. “Do not underestimate human contact,” Prof. Aksamija concluded, “sometimes just seeing that someone cares is already a contribution.” Enough for refugees to shake the feeling of hopelessness and explore their cultural identity and improve their well-being. Refugees do not behave like victims- they have skills, hopes, and dreams just like everyone else. We should treat them as such: inspiring them by giving them the tools they need to be innovators and explorers, and then step back and learn from their ingenuity and resilience.